It’s not so long ago that Arturia dipped a toe into the hardware sequencer market with the Beatstep, quickly following it up with the more assured Beatstep Pro. With its balanced set of features for MIDI control and sequencing, plus a generous dose of CV/Gate outputs, this was — and is — a worthy addition to setups ranging from monster Eurorack systems to totally in-the-box environments. And yet, flexible though it is, the BSP’s pads and encoders don’t cover every aspect of step sequencing, hence the arrival of the Keystep. First impressions are good; the Keystep is a solid marriage of metal base and creamy plastic shell. The first touch of its 32-note ‘Slimkey’ keyboard is equally promising, and the experience gets better when you learn it is equipped with velocity and aftertouch transmission. Compact and portable (at just 482 x 145 mm), it’s easy to imagine the Keystep at the heart of a live sequencing and performance rig. In place of a regular pitch-bender and mod wheel are two ribbons, the former having a ‘snap to zero’ action. Ribbons are a (minor) compromise compared to the tactile response wheels provide, but their main downside is probably lack of visibility. If you leave the modulation wheel anywhere above zero, there’s no physical sign of it. Usefully, the mod wheel can be assigned to any MIDI CC you choose, but the pitch-bender’s definition is fixed. If, like me, you view synthesizer pitch-bend with the same suspicion as mullets and ‘funny cat’ presets, this might seem like a missed opportunity, but one that, perhaps, could be addressed in a future update. The keyboard can be transposed by four octaves in either direction. Using the Shift key and the transpose buttons, you can toggle the behaviour of the keyboard in relation to the sequencer, choosing either to transpose the pattern dynamically or to use it for regular performance, on a separate MIDI channel if necessary. The final ‘performance control’ is a Hold button; it is handy for drones, for letting arpeggios run hands-free and for adding extra notes to an active arpeggio. A quarter-inch input is provided for a regular sustain pedal, whose configuration options cover those of the Hold button, plus a selection of MIDI CCs. Taken purely as a controller, the Keystep sits comfortably in a MIDI, CV or USB-MIDI environment, and is perfectly happy to transmit MIDI and CV at the same time. A Micro USB port ensures class-compliant MIDI communication with your Mac or PC, plus it supplies power. Arturia assume this will be your preference, and so only a single cable is provided. If there’s no computer nearby, you’ll need to source a USB phone charger or similar, which is the only blatant example of penny-pinching. I’m relieved that the Micro USB port is less wobbly than that of my Beatstep Pro though, even if I still wouldn’t be completely at ease trusting it in a live situation. Fortunately, this isn’t necessary because there’s also a 9V adapter socket. The power requirements (500mA) are light enough that it even runs from an iPad, although if you planned on using it that way extensively, purchasing an adapter would be a good idea. If it isn’t already obvious, the Keystep’s polyphonic sequencing is a purely MIDI thing, but there’s good news on the MIDI front. The In and Out ports are both full-sized, so there’s no need to mess around with fiddly adapters! The single set of CV/Gate outputs are joined by a third mini-jack, initially set up to turn the mod wheel into a voltage source. If you like, you can send aftertouch or velocity instead. Be aware that any reassignment involves the MIDI Control Centre software, so it’s not exactly spontaneous. My last slight niggle about the aesthetics is one I noted previously: given that many Keysteps are sure to find their way into Eurorack setups, Arturia could have made connectivity friendlier by printing the I/O text on the top rather than the rear. Actually, putting the mini-jacks on the top too would have been even better! Other reasons to download the MCC software include the tweaking of the signals sent and expected by the Sync I/O mini-jacks. When clocking from MIDI or from a typical analogue pulse, you can get started right away as the sync options are set via external DIP switches. Admittedly, these aren’t as convenient as the button of the Beatstep Pro and you might need to pay more attention to the manual than I did at first. Otherwise, you too might not realise the white portions of the switch diagram represent the ‘on’ positions, not the ‘filled-in’ parts. At the back of the Keystep we find a 9V power socket, three 3.5mm CV outputs, a quarter-inch sustain pedal port, MIDI I/O sockets and DIP switches to determine the sync source. The sequencer interface is stripped to the basics: a few rubber buttons, a switch and three knobs. Of these, the Rate knob is redundant when using external sync or if you tap in the tempo. There’s no row of flashing LEDs to indicate progress through a pattern, nor are there options for changing direction, skipping steps or repeating them. It’s not completely Spartan though; additional functionality is gained by drafting in the keyboard and the ubiquitous Shift key. Blue text indicates the MIDI output channels, gate lengths for sequenced notes and the 10 possible swing values. 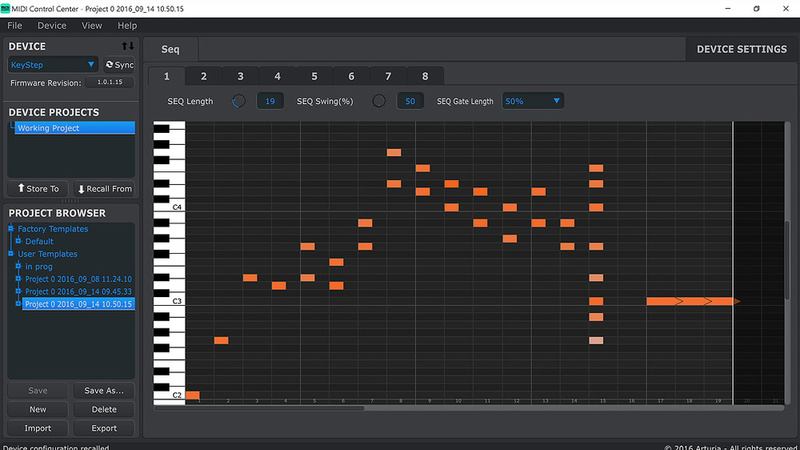 Swing involves lengthening the odd notes while delaying and shortening the even ones, and both note length and swing values are remembered on a per-pattern basis. When you wrap your fingers around them, you’ll notice that two of the knobs aren’t knobs at all but multi-position switches. They’re used to select the pattern to play and the current time division. This is undoubtedly cheaper than adding 16 buttons would have been, but buttons are faster and more direct. Realising this, Arturia have implemented a pretty decent workaround for option-jumping: if you press Shift while turning either knob, the new pattern or time division won’t kick in until Shift is released. Admittedly it’s a two-handed operation, but it helps you avoid all those embarrassing ‘oops, triplets’ or ‘the new pattern started a bar early’ incidents that can spoil an otherwise slick live performance. The Keystep is limited to just eight patterns, each of up to 64 steps. There are two methods of pattern creation, both giving results that are tightly quantised. If you were hoping for a MIDI recorder that plays back ‘as is’, the Keystep is not it. Whether you opt for step- or real-time recording, you can stack up to eight notes on every step but no controller information can be included, not even the sustain pedal. To begin step-time entry the Keystep must be stopped. Where sequencers are concerned, I’m no fan of unnecessary stopping, so this didn’t get our relationship off on the right foot. However, once I hit record and began banging in notes, chords, ties and rests, this seemed less of an issue. Adding legato notes is similar to adding tied notes: you hold the Tap button until you’ve entered those that should be legato; releasing it marks the return of normal progression. I’m happy to report that no manual was required for any of this — the controls are intuitive, even inspiring. It’s not perfect, though. In common with Roland classics the SH101 and JX3P, the Keystep doesn’t display how many steps have been entered. Personally, when I’m hitting keys, I rarely remember to count them, so while the frequency of happy accidents is on a par with those old favourites, a visual counter would have been even sweeter. Since that is impossible with the existing interface, perhaps other improvements will be forthcoming. My vote would be for a faster means of deleting patterns and an actual means of undoing drastic changes. Real-time recording works differently because it doesn’t create new steps, it merely overwrites the data found in the current pattern. You might therefore need to drop into step-time first and manually prepare the way, counting out all the steps you’re going to need. However your patterns attain the desired length, you must play the notes correctly on each pass; there’s no way to overdub and build up a pattern that way or return and edit them later. I guess if I were brainstorming a possible ‘Pro’ version, I’d probably want the option to turn off note ‘thru’ while recording too. Right now, the performer’s note input is heard exactly as entered. It’s only on the pattern’s first loop that it is tightened up. Along with notes, the Keystep captures velocities as they’re played and interprets notes held over two or more steps as tied. But however you play, individual note durations are discarded in favour of a single value for the whole pattern (from 10 percent up to 90 percent). Naturally, the note lengths also depend on the envelope of the connected synth. I mentioned ‘drastic changes’ earlier and one example of this is the potent (but ruthless) ‘Clear Last’ operation. This method of erasing the last step can be performed until all are gone and it works whether the sequencer is running or not. It’s a reasonable way to wipe short patterns, but remember the wiping is permanent. You can’t non-destructively shorten, as you can on the Beatstep Pro. The Append function does the exact opposite — it adds steps to the pattern’s end. This simple feature requires the sequencer to be running but is not to be underestimated. Using it, you can fix an initially odd-length pattern on the fly, adding a note or two without having to record them all again. Then, for re-synchronisation or simply to restart because you feel like it, Shift and Play is a logical enough button combination and works smoothly. That’s pretty much it for real-time recording. Incoming MIDI notes (from a keyboard or another sequencer) cannot be captured, but they are pretty useful for transposing Keystep patterns instead. If you were wondering about the rules for chords and that single set of CV/Gate connections, there’s a parameter set in software to determine which note is selected (low, high or last). Lowest generally seemed to make the most sense to me as the Keystep was generating analogue bass lines from a Studio Electronics Tonestar while a Waldorf Streichfett provided choral accompaniment. Any comparable setup should be enough to convince you that basic sequencing need not sound one-dimensional. 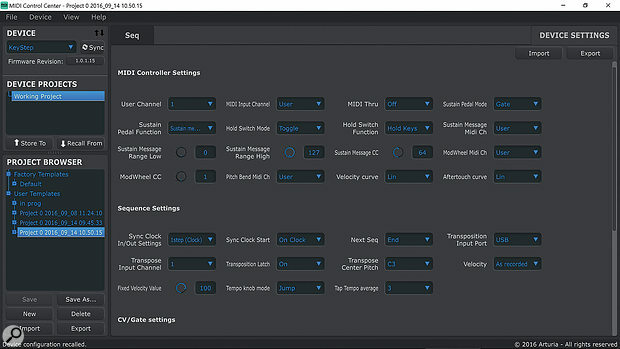 The MIDI Controller Centre software’s Settings page.The Time Division isn’t stored in the pattern, it’s always live. Four ranges are offered, from 1/4 to 1/32 and Arturia deserve credit for placing all the triplet values together in the second half of the knob’s travel. With a bit of practice you’ll soon be swapping between the 1/16 and 1/32 divisions to recreate the repeats and ratchets of other sequencers. Given that there’s no pattern chaining, 64 steps at the slowest (1/4) division offers a reasonable opportunity for varied chord progressions. It’s not really slow enough if you’re fond of drawn-out pads though but there are solutions to hand. For example, if you clock the Keystep from an external pulse derived from a clock divider (or from one of the drum triggers of a Beatstep Pro), life in the slow lane is more easily achieved. A single chord can be captured with a quick Shift-Hold combination. You can keep adding notes — up to the limit of 16 — provided you don’t release the keys. When you do, Hold flashes as a reminder the mode is now active. Lovers of expansive drones are sure to want to activate Hold too, in which case the flashes are twice as fast. There isn’t much else to say about one-note chords, other than they can be spooky, wonderful, complex things. And depending on the receiving instrument, they could just as easily be a set of loops or long-playing samples. Up to eight notes from the chord can be captured into a sequencer step or, at the flip of a switch, you can arpeggiate the entire chord. As far as possible, the fun stuff of the step sequencer applies equally to the arpeggiator, which is notable for having its own set of gate and swing values. The restart function also has a place, because the arpeggiator also has patterns — of up to 32 notes. Joining the regular Up, Down and Random modes are ‘Order’ (playback is in the order entered), plus Inclusive and Exclusive. Inclusive is simply an ‘Alternate’ mode in which the notes play from low to high then back again, repeating the lowest and highest notes. Exclusive is similar except it drops the repeats. In the final pair of ‘x2’ modes, each note is played twice as the pattern goes up and down. It’s not the most feature-packed arpeggiator. But to put that another way: the arpeggiator is fast and a genuine pleasure to use. In common with classic arpeggiators of the past, it is not key-sync’ed, so you won’t interrupt its perfect flow no matter how waywardly you feed it notes. Depending on the definition in the MIDI Control Centre, the sustain pedal either has a normal MIDI function or can act like the Hold button for slotting in extra notes. When extending an arpeggio in this way, you’re free to switch octaves as many times as you like to create large, sweeping patterns. While many of the Keystep’s internal parameters can be dealt with stand-alone, you can’t escape the computer indefinitely. It is needed to update the Keystep’s firmware, a task I performed at once to apply the most recent bug-fixes. Within the MIDI Control Centre, you decide whether the CV output should talk Oct/Volt or Hz/Volt and what type of gate is required, with the usual options offered. Unlike, for example, Arturia’s MicroBrute, the Keystep’s gate output has sufficient poke to drive the envelopes in my Eurorack modular. Essentially, if there’s a decision you’re allowed to make, the MCC is the place to make it, even if in some cases you’d have preferred to wait until performance. A case in point is whether patterns should switch at their end or on the next step. Ditto the choice of whether they are transposed in a latching or non-latching way. You don’t have a large pool of patterns to play with, but if you create something worth preserving, you can back up and restore from here too. The MCC’s graphical editor might seem like overkill, but Arturia can turn out that sort of thing in their sleep and some are bound to find it useful. The MIDI Controller Centre’s note editor. Ultimately, love it or loathe it, the software does what it’s meant to, and pretty painlessly. As a Beatstep Pro user myself, I only ever fire it up for firmware updates or to change the sync clock types. For the latter, the Keystep offers the following clock values: 1 step (Gate), 1 step (Clock), 1 pulse (Korg format), 24 ppqn and 48 ppqn. There’s a good reason you see so many Beatstep Pros paired up with Eurorack systems: you can’t buy equivalent modules at anywhere near the same price. The Keystep offers a similarly attractive package but with different strengths. It covers chord sequencing, one-finger chord playback and sports a rather decent arpeggiator. Apart from the need to stop before notes can be entered in step-time, it’s fast, flowing and ideal for live interaction. It’s also a neat controller keyboard for iOS, MIDI hardware, DAW-bound soft synths and analogue gear. The keyboard length is an improvement on the ‘standard’ two octaves and the presence of aftertouch is a bonus at this price. Speaking of bonuses, Ableton Live Lite is included, just in case you’ve lived this long and failed to pick up a copy. Once you accept that every change made to a pattern is stored automatically, you should have no qualms about embracing the Keystep for its immediacy. Of course, no matter how much I praise operational simplicity, it’s hard not to wish for just a tiny bit more. In this I feel justified in blaming Arturia since it is they who set the precedent for a ‘Pro’ version with the Beatstep. 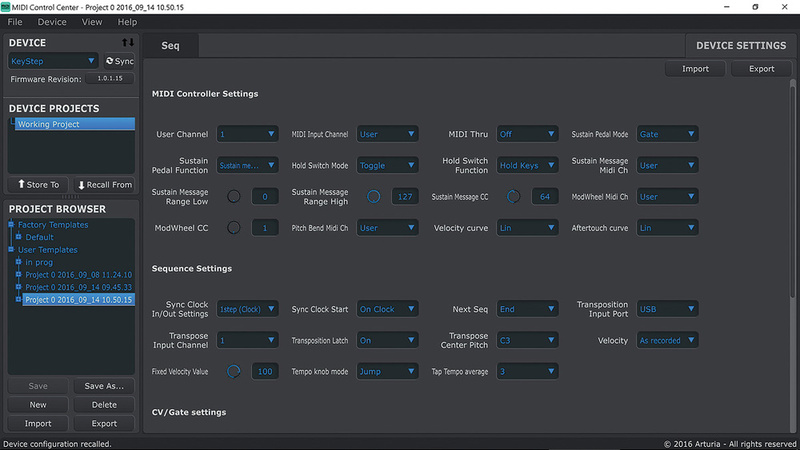 Whether or not a bigger, more sophisticated sequencer with pattern chaining, multiple channels and loads of storage is in the pipeline, the Keystep today is an excellent partner for no-nonsense sequencing, either by itself or as part of a multi-sequencer environment. Intuitive, fuss-free polyphonic step sequencing. ...and a one-finger chord mode. Can be master or slave in a MIDI, USB-MIDI or analogue environment. Aftertouch is a pleasant surprise. Step-time entry requires you to stop the music. Only eight patterns and no means of pattern chaining. While it’s tempting to wish that Arturia went straight for the ‘Pro’ version, the Keystep is simple, fun and easily justifies its existence.